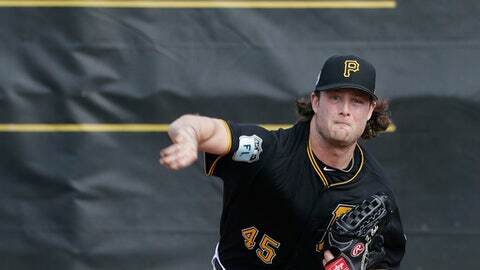 BRADENTON, Fla. (AP) Two years ago, Gerrit Cole won 19 games and finished fourth in the National League Cy Young voting. After slogging through an injury filled 2016, the Pittsburgh Pirates’ ace has set more modest goals for the upcoming season. On Tuesday, when Pirates pitchers and catchers held their first workout of spring training, Cole threw a normal bullpen session. He fired 35 fastballs in front of a crowd of a couple dozen fans and several keenly interested members of the Pirates’ coaching staff and front office. It was uneventful. It was mundane. And it was exactly what Cole needed. Last year, Cole sustained a rib injury about a month before camp began. It threw his offseason training routine out of whack and still bothered him a couple of months into the season. Cole went on the disabled list three times. In June, he was sidelined by a strained right triceps. In August, it was right elbow inflammation. On Sept. 13, he was shut down for the season by right elbow posterior inflammation. Never fully healthy, Cole lurched to a 7-10 record with a 3.88 ERA. His averages of 10.2 hits and 2.8 walks allowed per nine innings were career worsts. With Cole hobbled, the starting rotation tanked. Opening day starter Francisco Liriano never pulled out of a season-long funk and was traded in August. Manager Clint Hurdle was forced to plug the holes with rookies Jameson Taillon, Steven Brault, Trevor Williams and Chad Kuhl. Pirates starters racked up the third-fewest innings in the NL and ranked 11th with a 4.67 ERA. The team finished 78-83 and missed the postseason for the first time since 2012. ”At the end of the day, the biggest thing was we weren’t able to pitch the ball the way we had the previous three years, which complicated everything else,” Hurdle said. Cole ended the season on the 60-day DL and worked out over the winter at a facility in Los Angeles operated by his agent Scott Boras. By mid-November, when Cole honeymooned with his wife in the Caribbean, he finally felt healthy again. As he dressed for his first workout at Pirate City, Cole laughed when someone asked if he played catch on the beach with his wife Amy, the sister of San Francisco Giants shortstop Brandon Crawford. This year, Cole is back on a normal spring training routine. He is expected to anchor the front end of the rotation with Ivan Nova, who in December signed a three-year, $26 million deal. Hurdle has not yet indicated which pitcher will start on opening day against the Boston Red Sox. Although Nova has more experience, Cole has other things working in his favor.